While I am not very comfortable at accepting awards, I was given one to me by Just Ramblin' that made me take a minute and think. That someone felt our blog was worth noting and I take a quiet bow in thanks to enjoy the small limelight of this special award. Now for the best part. While I am not obligated to pass it on, I can not help myself. For the best part of receiving this award is the giving it to someone else. I am passing this award to someone who I think is a genuine blogger and think anyone who knows her would agree. The first post I read by her I was hooked. Her ideas are fresh and real and there something about the way she relays her stories and thoughts that will make you laugh and cry. A first time dog owner with challenging, high spirit pooch who is a mixed bag of quirks and desires that gives her a reason to blog almost every day. This blogger doesn't shy away from the tough questions, believes in the causes and isn't afraid laugh at herself or her crazy dog's antics. I don't know how many times I have read one of post and found I was thinking the same thing.. Her writing beautifully flows with a strong passion about the injustices that are inflicted on animals and is done so with heart. She has style and grace and appreciate her honesty and genuine care that radiates through. I think the name says it all. :) If you haven't visited Kristine please stopped by and say hello! 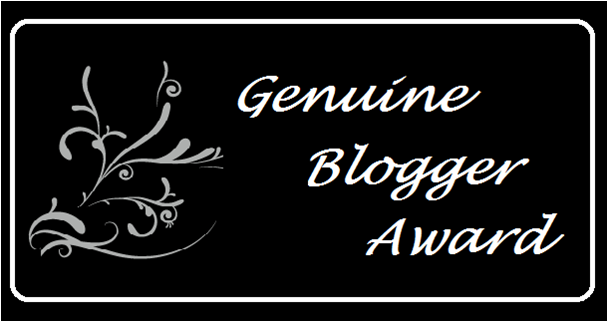 For anyone who would like to give this award to someone you think is a Genuine Blogger, please visit Just Ramblin'-Genuine Blogger Award. Yay! Great choice! I am also a big fan of Rescued Insanity. You very eloquently described just why Kristine's posts are so wonderful. And congratulations on your own award. I know it's not quite as enjoyable as a fuzzy head on your knee but it's fun to be reminded that people are enjoying your stuff, isn't it? Congratulations on your award! You deserve this one! I agree, Kristine has a great blog going! I never know what exactly I'm going to get when I go to visit her, but I know it will be good! Thank you so much! That was so sweet and so kind, I really don't know what to say. You are going to have me crying at work. I am beyond touched and honoured. I love coming by your blog as well as you always write from such a heart-warming perspective. Your posts make me think about my relationship with Shiva on a much deeper level. What you have with your dogs, especially Brut, is inspirational. Thank you so much for sharing this part of yourself so freely with us. Congratulations on a much deserved award. 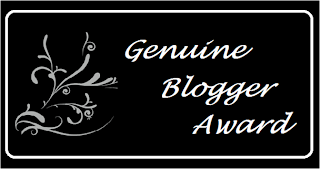 Your blog is genuine and from the heart! Thanks for introducing us to Rescued Insanity, it is all you promised and has a great voice. Congrats on your wonderful award! Very well deserved! And congrats on the award - you totally deserve it!